No, this is not a sordid tale of galloping lust and sexual debauchery (rumored to be rampant in expat communities), so if that’s what you’re hoping for, go away. Living the expat life in an exotic country, you often come across these small mysteries and quirky events that brighten your day. Okay, big mysteries as well, and they might not brighten your day, but let’s not ponder those for the moment. The story below is about my conversation with our gardener while we were domiciling in Ghana, West Africa. Having a gardener is one of those wonderful luxuries you can afford while living in some foreign countries. You may not have electricity or water for hours or days on end, but hey, you don’t have to pull weeds or mow the lawn. Ali the gardener is watering the flowers. Coming to work at seven, he always wears proper pants and a fancy shirt of some sort, and then changes in the garage into ragged shorts and an old T-shirt for work. He’s a Muslim and prays in the garage using a flattened cardboard box as a prayer mat. He’s a mild, modest man who has already done wonders in our garden in a short time. I skip down the stairs and out the door to speak to him. I’ve discovered a fairy-tale flower growing in front of the house. It’s white and delicate and looks a bit like an orchid. It has a lovely perfumy fragrance that spreads itself far and wide. Ali shakes his head and looks regretful. He does not know the name, only that it belongs to the ginger family, going by the looks of the leaves. “It smells wonderful,” I say. He gives a mournful little smile. “I not hear the scent,” he says. I look at him, surprised. “But it’s very strong!” I tell him I have one of the flowers in the living room floating in a dish of water and you can smell it all over the room. I bend over one of the flower clusters and sniff. It’s lovely. It’s potently fragrant. “How can you not smell it?” I ask, dumbfounded. He shrugs fatalistically, saying that’s how Allah has made him, without hearing scents. “Not even vomit,” he adds. So I start my day. NOTE: In the fullness of time I discovered the identity of my mystery flower, which, as it turns out, is not an uncommon bloom at all. It’s called a butterfly ginger or, more scientifically, hedychium coronarium. 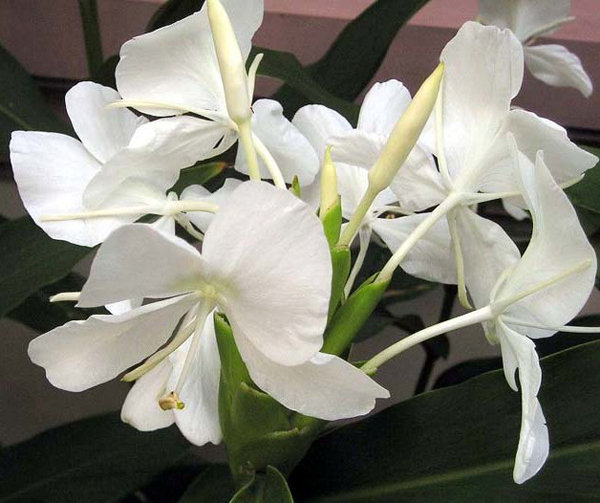 It grows all over the world in humid tropical places, smells heavenly and can be invasive. Let it invade, is what I say. Have you ever been enchanted by a mystery flower, or a gardener? But now you get comments because you are hilarious! This lily grows in clumps by our garden wall…I ‘hear’ the scent every time the flowers bloom. I’ve been trying to grow them all around the yard. The sea water damaged the ones outside the bedrooms. We have no idea what it’s called. When we lived in Singapore, the second day we were at our house, a guy showed up with a lawnmower and said he was the gardener. We never really hired him but he’d come and cut the grass and collect his money all the same. I don’t think he had a clue about the flowers though. He just cut the grass and left, never really speaking a word. Not all gardeners are created equal. Hey, you got your grass cut. It would have been a job to try and get someone else. Hiring people is always a tricky thing. What a great way of expressing a lack of sense of smell. I just wrote a story about how my dog’s sense of smell is growing with age as her hearing and sight decline. I hope this does not apply to me as I get older, especially in restrooms. Getting old and declining is not fun, but think of the alternative. Ali must have been an exceptionally knowledgeable gardener, to be able to identify flowers without their scents. He was right about the ginger family thing. Yes, we have power cuts everyday and our water gets contaminated regularly, but we do have the luxury of a maid, nanny and driver (though over time they become more part of the family rather than just the hired help). The joys of expat life! It was rather an adjustment living in the US and having no household help. Then again, there’s always water and electricity. Except what a blizzard hits! What a gorgeous flower. Poor lad that he isn’t able to smell although as he said bad smells won’t bother him either. I do enjoy having a garden, both to sit in and to look out at, although I’m not very good at doing the necessary work to keep it nice. How sad he had no sense of smell, it is one of the joys of gardening. No doubt it affected his ability to taste as well.